Want to know what a healthy gut and Gisele Bündchen have in common (apart from a flat stomach)? They are both fans of the anti-inflammatory diet. Anti-inflammatory eating as the name suggests involves eating natural, unrefined foods that don't inflame the gut. And naturally, as any Victoria's Secret model diet would suggest, it's the hottest thing headlining the health world. Said to support everything from a balanced microbiome and strong bones to helping fight cancer, the anti-inflammatory diet is not only proven to be powerful medically, but mimics much of the same clean-eating philosophy. Not long ago, Bündchen's personal chef Allen Campbell made headlines when he revealed that the supermodel avoids all foods in the deadly nightshade family due to their inflammatory nature. 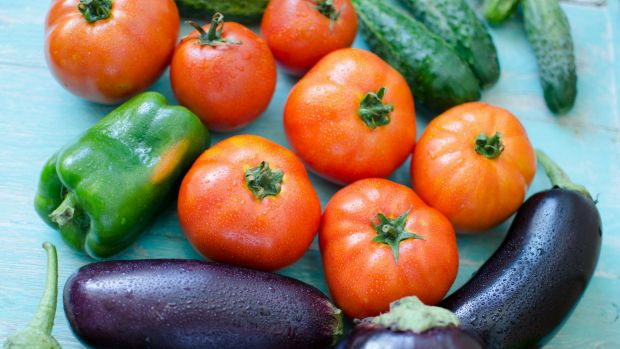 For those who aren't familiar with the term, deadly nightshades are part of the solanaceae plant family and include the sweet potato, eggplant, tomatoes, potato, capsicum – aka common diet staples of a clean eater. So just how complicated is the anti-inflammatory diet? Surely sweet potato is not off the menu? Well, according to Sydney dietitian Jo McMillan, you won't have to switch to kale-only chips quite yet. "There is no solid evidence that nightshade vegies are inflammatory, they all have useful levels of nutrients and phytochemicals that can benefit health," she says. Phew! "But, potatoes do have a high GI, so if you have too large a serve you'll stimulate a big insulin response and over time that could be inflammatory, but in small quantities, in skins and as part of a healthy diet, it isn't a problem for most." So what exactly constitutes as anti or pro inflammatory and why is reducing inflammation at the forefront of health right now? According to McMillan, chronic inflammation is one of the root causes of major diseases. "There are two types of inflammation: acute inflammation which happens when you injure yourself and your blood rises as part of the immune system's response to injury or infection, and chronic inflammation which results in damage and is involved in many chronic diseases. For example, we know chronic inflammation accompanies obesity and may be one explanation for the increased risk of metabolic syndrome, heart disease and many cancers in those who are obese." Lowering the risk of chronic disease is a pretty good reason to up the "anti" alone, but a new study has also revealed it can boost bone health too. Ohio State University conducted a clinical trial looking at women who followed a high anti-inflammatory diet rich in vegetables, fruits, fish and whole grains and those who didn't. The results found those on a high inflammatory diet lost less bone density than peers who ate low inflammation foods. And interestingly the anti-inflammatory eaters were also at lower risk of hip fractures. Caroline Trickey, a Sydney nutritionist and dietitian, has also seen the anti-inflammatory diet have an effect on those suffering from rheumatoid arthritis. "I have clients with rheumatoid arthritis who have been able to lower doses of medication to manage their symptoms and one who was able to manage her symptoms purely through what she ate with no medication. "I've also seen it help osteoarthritis, rheumatoid arthritis, gout and other inflammatory conditions such as psoriasis and inflammatory bowel disease." And even for those not concerned with arthritis, the anti-inflammatory lifestyle is becoming more interesting from an environmental aspect too. "We live in a pro-inflammatory world with stress, exposure to pollution and environmental toxins as well as genetics all affecting our inflammatory state," Trickey says. It appears the general public is taking note. Trickey, who also runs a cooking school Healthy Home Cafe in Sydney, has noticed a substantial rise in interest. "I've been running anti-inflammatory cooking classes for years now but have really found an increase in enquiries and people even requesting to go on the waitlist for classes – it's been so popular I've had to keep it up." Beyond bone health, the stomach-flattening benefits probably have a little (or lot) to do with it too. According to Sydney naturopath and founder of Ovvio Organics Anthia Koullouros, it's the first thing her clients notice after trialling it. "The most common thing they say to me is that they've deflated. By reducing inflammatory foods it not only helps them lose weight but also de-swell." And with gut health at the forefront of wellness, Koullouros believes the diet is only going to continue growing in response to our increasingly stressful day-to-day lives. "There's definitely a rise in gut issues as a result of poor eating, recreational and over-the-counter drugs and stress; my practice is full of these patients," Koullouros says. And along with unhealthy lifestyles also comes the symptoms: "More than ever people are reporting bloating, tummy discomfort, constipation, hormonal imbalances, mood changes and poor cognitive function," all of which Koullouros says an anti-inflammatory diet can help. Overall though, she believes cutting the inflammatory foods isn't the end-all solution, just a good start. "An anti-inflammatory diet is not the ultimate diet, I see it as a stepping stone to eating what we've evolved to eat rather than applying a diet to a disease state. I would say it's a good transitionary diet to wellness, then it's about maintenance and thriving on real food." Feeling inspired to cut inflammatory foods for good? Balance out your body with our anti-inflammatory cheat sheet. "Anything that's free of of sugar, additives, refined salt and vegetables oils," Koullouros says. 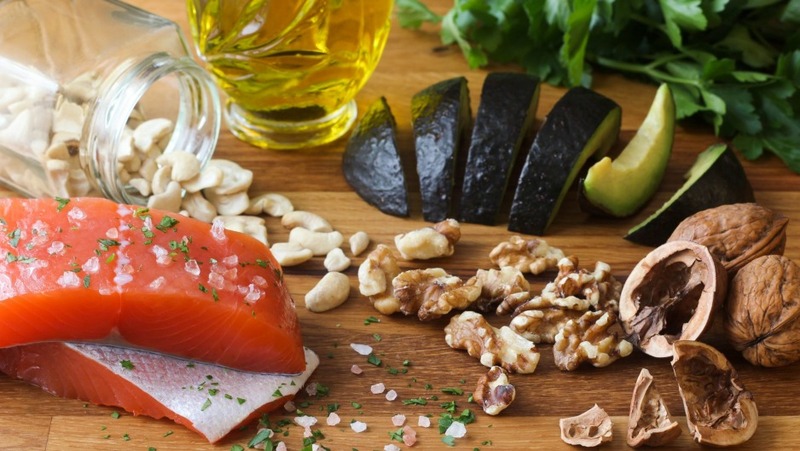 "Science backs the the anti-inflammatory benefits of omega 3 fats such as walnuts, linseeds, chia seeds, soy beans and oily fish – as well as correcting the omega 3 and omega 6 ratio by reducing your intake of sunflower and other polyunsaturated oils and margarine which can be pro-inflammatory," Trickey says. "Go for extra virgin olive oil as it's anti-inflammatory, whereas seed oils are not," says McMillan. "Choose well-sourced, healthy animals that are grass-fed pastured and non-farmed fish and seafood that are prepared in the kitchen or factory end in a way that preserve nutrition and aids digestion," Koullouros says. "Try turmeric and ginger in cooking and for a supplemental form (prescribed by a naturopath) I would recommend barberry, oregon grape, calendula, chamomile, wild yam, meadowsweet, licorice and chickweed for gut health." Kangaroo steak sprinkled with bush spices and served with vegies roasted in extra virgin olive oil and garlic. Or for a more step-by-step approach, try out one of the following anti-inflammatory recipes from The Healthy Chef Teresa Cutter as featured in her Purely Delicious cookbook. 1. Combine ginger, turmeric, garlic, tamari, lime juice and olive oil into a bowl. 2. Fold in the finely chopped coriander root. 3. Spoon paste over the fish fillet and massage well on both sides. 4. Heat a pan over a medium heat and add the fish fillet. 5. Pour in 1/4 cup of water or coconut water then place on the lid and reduce the heat. 6. 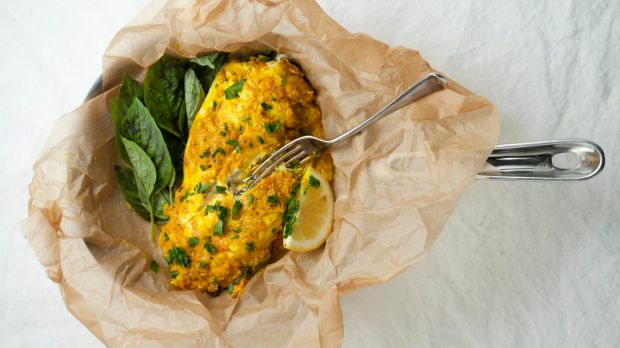 Braise on a low to medium heat for eight minutes – occasionally coating the fish with the delicious juices. 7. Serve with your choice of salad or vegetables. 8. Add one generous teaspoon butter for a richer more decadent sauce. 1. Wash kale and remove the tough inner stem. Shred the leaves and place in a large mixing bowl. 2. Add salt, pepper, lemon juice plus the olive oil. 3. Massage the leaves for 1-2 minutes or until the kale has slightly collapsed and softened. 4. 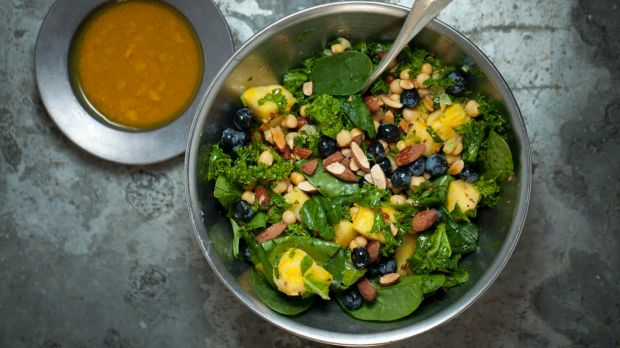 Add spinach, parsley and mint, pineapple, blueberries, pumpkin seeds and almonds. 5. Combine dressing ingredients then pour over the salad. 6. Toss it all gently until the aromatics are evenly distributed through the salad. 7. Divide between serving bowls.